The all-over protection you can get for your Samsung Galaxy S4, iPhone 5/5s, and iPhone 5c is now available for Samsung Galaxy S5 with our CandyShell + Faceplate. Samsung’s latest in innovation made a big splash when it was announced back in February. What better way to pair your waterproof, dustproof smartphone with the ultimate drop-protection? Now that’s what we call full coverage. Need help applying or cleaning your CandyShell + Faceplate? Follow our step-by-step instructions (they’re the same for your Galaxy as they’d be for your iPhone). 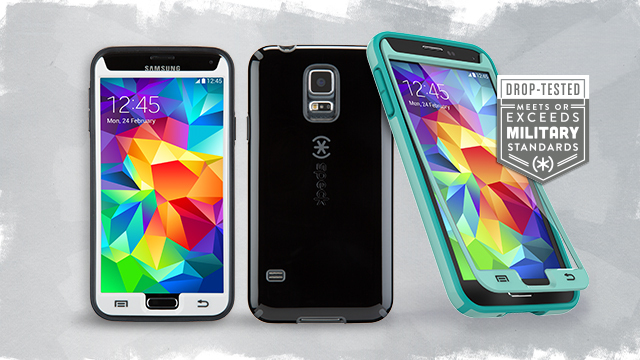 Plus, don’t forget to check out the rest of our military-grade case lineup for your Galaxy S5. Any other questions you may have about our mighty slim protection for your favorite smartphone can be answered in our Galaxy S5 FAQ. Happy shopping!